A simple recipe that’s yummy to eat and nice to see. 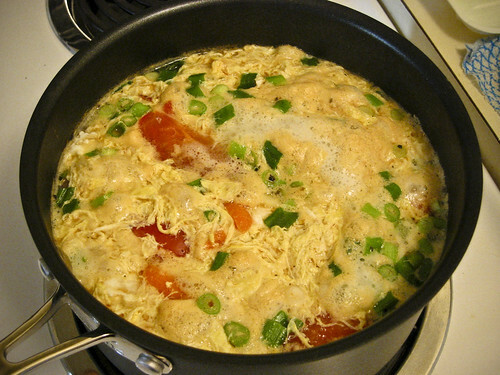 The color and sweetness of the tomato contrasts with the egg and scallions. This soup is tasty all year round. Something my mom frequently cooks when we were kids. 1. Bring soup stock to boil in covered saucepot. 2. While stock is boiling, wash tomato and cut off front end. Cut tomato in half, then slice thingly into 1/8 inch wedges. Add tomato wedges to boiling soup stock, cover, and continue cooking on moderate high heat for 4 minutes. 3. Turn off heat. Slowly pour in beaten egg and stir gently, until egg is cooked, about 30 seconds. Add diced scallions and sesame oil. Add salt and pepper to taste. 4. Laddle to soup bowls and serve. At first glance, I thought it was a frittata! And then I saw it was a soup! Delicious. It looks really comforting.